Leaks May be a Significant Source of Shielding Gas Waste. Checking for leaks is often overlooked as a source of significant cost reduction. WHAT IS THE LEAK RATE? It provides a simple approach to allow calculation of the gas leak rate in pipelines and gas hoses. 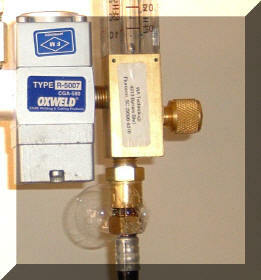 A leak detect solution is very effective in finding even very small leaks. The photo left shows how a leak detect solution found a 1 to 2 CFH leak. We plugged the hose end and slightly loosened the fitting to produce this leak. The ball in the flow gauge was just off its seat. A simple leak detect solution easily found the leak. The bubble test solution quickly produced bubbles. Using a leak detect solution is better than soap. It will produce smaller bubbles and more accurately define smaller leaks. It also will not corrode the brass fittings. Ultrasonic leak detectors can be used to find leaks, we have and use one in our consulting service. However we have found that a welding or cutting arc, MIG, Stick or Plasma Cutting interferes with the reading. Arcing of electric motor brushes also confounds the gas leak noise. The amount of noise these and other machinery create will be detected with an ultrasonic tester and obliterate any leak sounds. It must be used when these devices are not operating. Did you know if shielding gas is leaking out of a hose or fitting, air and moisture are leaking (diffusing) back in! Sounds strange--it's true. Our Lean Welding Manufacturing Learning Program explains how John Dalton in 1776 defined the law of partial pressures that explains why the air flows in that direction. You can see that "Self Learning" product under the BUY TAB on the top of the page under "Training." Interested in more information on how to manage leaks?